From Our Joyful Paws to Yours! + Tough and durable +Made in USA + Rope & canvas streamer helps to remove tartar + Fun shaped can be carried and toss + Recommended by vets and dog trainers around the world + Stand up to tough chewer + Knots add interest and challenge Includes: 1 x Petstages Mini Barbell Chew Material : Solid Plastic and Nylon Measurement : 17 cm Suitable for dogs up to 10kgs Example Breeds: All small and toy breed. 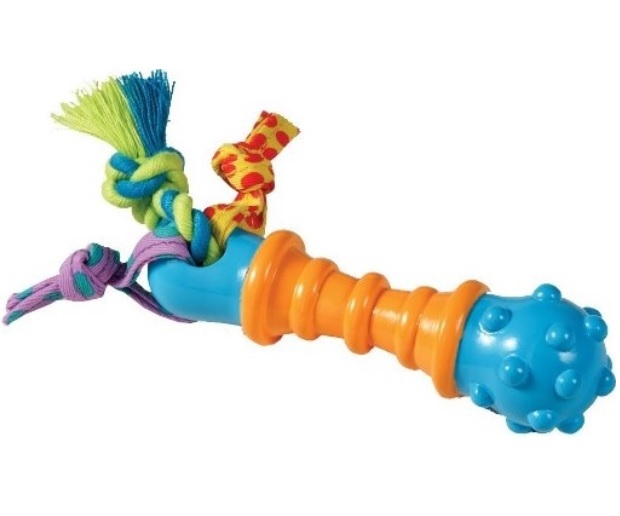 Caution: Always observe your pet's behavior when given a new toy. Remove or replace the item once it is torn or damaged. Power Chewers may need to size up one or two sizes. Payment can be made via bank-ins, Paypal (request) or credit/ debit cards via our partners Lazada, Lelong or Shopee. Delivery will be made via local courier service with tracking number. For Malaysia and Singapore only. For more pictures do refer to our Lazada or Lelong webstore.